For some reason toners are oft-neglected as part of a skincare routine. Just because it doesn't feel like they're doing anything for your skin doesn't mean that they aren't beneficial to it. In fact many toners that feel like they're 'working' on the skin have a high alcohol content. Alcohol is something you really should try to avoid when choosing a toner. It may look & feel like it's shrinking your pores when in reality it's just drying out your skin. If you're a fan of chemical exfoliants like me then it's important to keep your skin balanced by following up with something gentle & hydrating. This helps to maintain the skin's pH level which is important for preventing everything from eczema & redness to acne & wrinkles. Toner helps to bridge the gap between cleansing & moisturising so that your skin feels prepped for the products to come. Personally I prefer using spray toners as they feel so much more refreshing upon application than swiping your toner on with a cotton pad. In the Summer I also like to pop one of these sprays in my handbag as a quick pick me up for the skin. Keeping your toner of choice in the fridge overnight will further enhance it's cooling powers, leaving it perfectly prepped for a day out in the sun. I've used various different spray toners over the years but the first one that I truly fell head over heels for was the Caudalie Beauty Elixir. I will never get tired of it's wonderful scent. It imparts a minty tingle to your skin, perking it up & making it glow. I tend to keep this one exclusively for my handbag as not only does it freshen up your face but it helps to calm & clear your mind too. Ever since I tried La Roche-Posay Serozinc it has been a staple in my skincare routine. This is the one I reach for on a daily basis as it contains a zinc sulfate solution which can reduce redness & irritation. Zinc also has acne-busting properties so I use it to keep my blemishes in check. Combine this spray with a Zinc + Copper supplement to give cystic acne the boot. It's criminal that La Roche-Posay haven't brought this to the UK yet but it's well worth hunting down if you're holidaying in France. Alternatively you can get it on eBay. 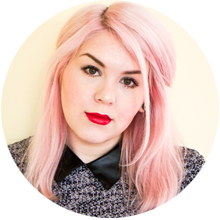 I remember when I first started blogging that Liz Earle was the biggest thing in skincare. I subsequently went out & bought practically every product they made. Since then I've obviously moved on to other brands but there's still a few key products that I would recommend. I always pluck my eyebrows using the Instant Boost Skin Tonic. It makes it easier to wipe away the strays hairs & immediately calms down any redness in that area. The ingredient list is full of soothing ingredients including cucumber, chamomile & calendula. I enjoy it's soft botanical scent, it kinda reminds me of baby powder. I also used to really be into Dermalogica & have spent a small fortune on their products over the years. Their Multi-Active Toner remains a firm favourite due to it's skin balancing properties. It doesn't contain any alcohol yet it manages to keep excess oil production at bay. It also features arnica, cucumber and moisture-binding humectants to hydrate & smooth the skin. My latest toner love is the Elemis Soothing Apricot Toner. This toner is incredibly hydrating & smells amazing! It makes my skin feel really soft & look beautifully radiant. The formula is very gentle making it a great choice for those with sensitive or irritated skin. Use it sparingly as it can feel a bit sticky if you go overboard with it. Elemis make so many lovely skincare products, I want to try them all! 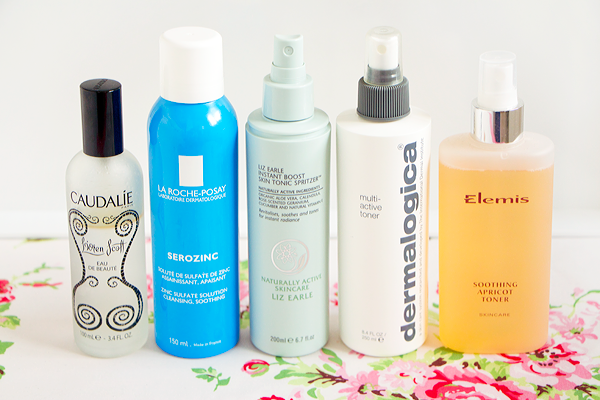 What's your favourite spray toner? the caudalie bottle looks really pretty :) i really need to ty it out! oh i really want to try a few of these! This is one makeup item I've not tried, but this post has definitely inspired me!